I’m not sure who gets the original credit (please comment if you know — I linked one of the older references I found) for the running gag in the autistic adult community about the Neurotypical Syndrome. It does highlight the us v. them feeling that a diagnosis can create for autistic adults, and frequently, especially for those who struggle, but are living their lives, this dichotomy is really not what they need. As a neuropsychologist and a director, I have many different job responsibilities. At the core of my profession, however, I’m a diagnostician. Thus, I believe strongly in the idea that diagnosing people is valuable, for the reason that I believe specific therapies or treatments (I hate the term “counseling,” but that’s another blog post!) fit specific diagnoses and the meshing of these two into a coherent treatment plan is crucial to really helping people thrive. Thus, I do think there is value in diagnosing autism, and if the signs and symptoms of autism are impairing (which is necessary for diagnosis), I think it’s reasonable to call that a disorder and to treat it. I’m not about to depart from this belief system. I’ve seen what my team can do based on this approach and know how it changes lives. But it’s also quite clear that someone can clearly have autism or be autistic and yet be doing just fine — in fact, although I would be happy to have a conversation about a “cure” for autism if and when this should prove feasible, I’m pretty happy helping people to “do just fine” and I am not at all sure that a “cure” would be a better choice than thriving with autism. As a referential point (I’m not autistic myself), I have Ménière’s disease, in a mild form, and after several evaluations (it took nearly five years of mentioning, but not really complaining about, the symptoms to my doctor before an ENT gave me the obvious diagnosis), it continues to be part of who I am and how I function, but I do just fine without any treatment. To me, I don’t view it as any less a disease or disorder because I don’t need it treated right now, but I would respect if someone said they didn’t see their being autistic as a disorder if they, like me with my ear problem, were doing just fine. Of course, Meniere’s disease is not autism in many senses — it’s harder for me to say that I thrive because of it, and if I were offered a cure, I would probably seriously consider it. In addition to this, a great comment to a prior post does bring up the excellent point that neurotypicality itself is more of an abstraction than a well-defined group of people. There is so much diversity in cognitive / emotional skill-sets, from one person to the next. By comparing the group of people with autism to this abstraction, do we just serve to magnify many differences that are really not all that remarkable, particularly in those “doing just fine?” Is this as absurd as calling everyone who is not Jewish a “gentile” and assuming that we can be treated as a homogenous group purely by virtue of our non-Jewishness? These kind of out-group designations serve a valid role, and there’s a reason why there are so many examples of them (most far less palatable to discuss than the concept of being a “gentile”). The positive reasons mostly have to do with establishing the in-group identity. So, the concept of neurotypicality is really mostly of interest to autistic people and the clinicians, researchers, educators, and others who serve them. But it also has its limitations, particularly for high functioning people, because being part of a minority is already isolating in itself, and the social challenges people with autism face are isolating, do we really need to do more to create a system of isolation? And then, there is really no “bright line” separating autism from neurotypicality, and in particular, the idea of a neurotypical itself is a problematic one. Who is actually neurotypical? Am I, trained at the graduate level in both engineering and psychology, who learned to program computers in first grade, neurotypical? We know, in neuropsychology, for instance, that many people have cognitive skills in some area or another that are significantly stronger or weaker than average, without this necessarily representing a disorder or a deviation from typicality. 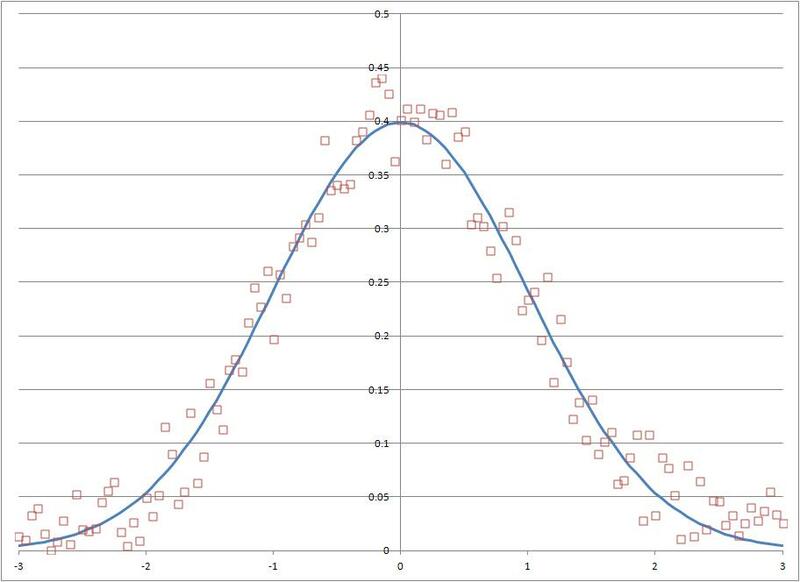 We talk all the time about autism occurring on a spectrum, but it is important to realize that many (but not all) human characteristics widely vary from person to person, frequently with something that approximates the normal, or Gaussian distribution, like in this picture (this could be height, weight, IQ, or a whole host of other things). We have a mechanism, diagnostically, to separate people with autism from people with other diagnoses (or no diagnosis), but where are the lines, for those of us who are high functioning with or without autism, when it comes to specific ostensible “symptoms.” Where is the line between having a sensory abnormality and just a preference? I don’t like it when clothes are constrictive around my wrists. Lots of kids don’t like tags on clothes, tight pants (and some people who like tight pants, I think we all agree, would do better to not like them so much! ), and so on. “Normal” people have aversions to food textures all the time — I couldn’t tolerate either gravy or whipped cream coming anywhere near my food until I was in my late thirties! An example I give parents and high functioning autistic people, quite frequently, when talking about transitioning sensory issues from dealbreakers to manageable issues, is thinking about minor back strain. I could come up with a fancy term for why my back hurts when I sit at my desk too long. I could probably even call it a sensory integration issue. But, if getting up periodically and talking a stretch solves the problem, wouldn’t it be easier to just do that? Since an autistic person doesn’t know, innately, what being “neurotypical” is any more than a person without autism knows what being autistic is, how do we know for sure when each molecular issue should be considered in the context of autism? Many of these molecular issues may conceptually tie to autism, but that may not mean they have a unique course of treatment — for instance, cognitive behavioral therapy seems to treat anxiety in people with high-functioning autism just like it would in people who do not have autism). So, taking all this into consideration… I continue to believe diagnosis and treatment of autism is helpful, and I think both can be done in a valid and reliable way. But, I am cautious about treatment having the unintended consequence of preventing people from thriving rather than enabling it. I am also sensitive to creating boundaries or barriers between NT & ASD, since I see us much better working hand-in-hand. And, I am sensitive to the fact that it is not always either necessary or beneficial to understand or pathologize a symptom in the context of autism, when often simple solutions can help manage it just fine. Nonetheless, I think there is some value in the concept of the neurotypical. Mostly this has to do with helping people with autism understand what functions, in essence, as a dominant cultural structure, even if the term belies the actual heterogeneity of people who do not have autism. As for me, I declare myself neuro-not-so-typical. Welcome to the revolution. ← United States of Autism Coming to Grand Rapids, MI!